Sister Smirk takes pop songs and reflects them through a funhouse mirror. Pop music has a storied history, one full of girl groups and boy bands and solo stars that spans decades and genres and themes. Pop has taken on many forms over time, from doo-wop to indie pop, from crossover country to EDM. It’s impossible to categorize pop as a single form because it’s so much more than that. Roseanna Safos, the brain behind Sister Smirk, is acutely aware of pop’s history. Ruff Tape is an exploration of pop’s various forms, an exercise in taking old styles and making them new, adopting them to your own vision. Safos takes simple melodies and reflects them through a funhouse mirror, turning familiar song structures into something utterly new. On Ruff Tape, she distorts country music, the girl group stylings of the '50s and '60s, and even, on “Triskit,” the commercial jingle, into absurd yet beautiful shapes. 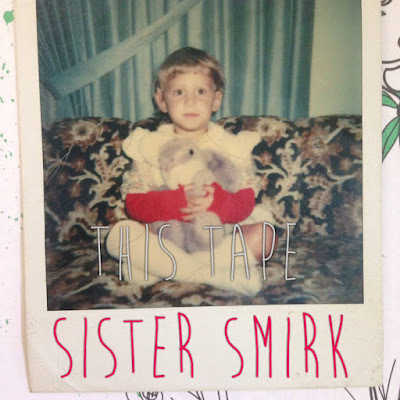 Sister Smirk reads between the lines of these familiar tunes and lyrics and unearths the desperation that often lurks behind love songs and the hope implicit in sad songs. Safos speaks to universal emotions in a way unique to her experience, and the individuality and intimacy of Ruff Tape are what make it shine. True to the project’s name, Ruff Tape is like the sonic manifestation of a smirk. Some songs, like “Blah,” a short chant reminiscent of schoolyard chants or a very timid rap battle, or “Triskit,” the aforementioned commercial jingle parody, are totally silly. But while Ruff Tape is buoyed up by its sense of humor, Safos approaches each song with an earnestness that keeps the album from being too goofy. On “Temporary,” perhaps the strongest song on the album, she leaves behind any jokey veneer to craft a bittersweet meditation on the transience of relationships and finding comfort in yourself. The song is personal and open-ended in a way that few songs are. Safos is singing purely from the heart and it pays off big time. “Temporary” is evocative of some of the indie pop greats, recalling Waxahatchee or Kim Deal’s quieter solo songs. But in general, Ruff Tape defies comparison or categorization. The album is fluid and chameleonic with each song totally different from the next. Even if pop music is in Sister Smirk’s DNA, Ruff Tape is experimental in spirit. There are a lot of things to love about Sister Smirk, but what makes the project so special is Safos’ ability to take the forms she loves and recreate them in her own image, imbuing them with a spirit that is uniquely her. Ruff Tape doesn’t take itself too seriously, and Safos lets her creative whims take her wherever they may lead. “I Found My Baby,” Ruff Tape’s second track, is a perfect example of this. Most of the song is giddy and fast-paced and girl group influenced, but in the last minute it slows down into a more disjointed array of noises, taking a more melancholy turn. And then, just as quickly as the tone shifted, it shifts back again. The song contains multitudes and leaves its emotional tone up to interpretation, which makes it even more compelling than it would be otherwise. Safos understands that different impulses can be contained in one song, and that there’s no way a song has to be. In a time where pop music can seem formulaic and stale, Sister Smirk shows us that it doesn’t have to be. Listen to Sister Smirk on bandcamp.